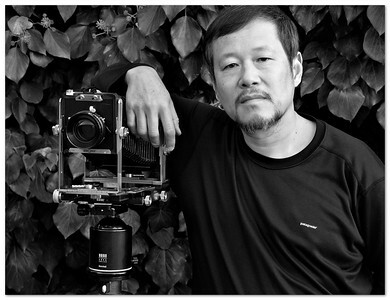 Leping Zha, Ph.D. was trained as a medical imaging physicist, fine art photography has been his second profession. Working mainly in color with medium and large format film camera equipments, Leping Zha concentrates his passion in grand landscapes as well as fine natural patterns in both western and eastern worlds. Constantly searching and studying the forms, order, balance, inner relationship, grandeur, and drama of nature, he has been tirelessly exploring to capture truly magical images with ultimate quality and finesse to transcends the subjects into impeccable art elements, and to integrate both eastern and western artistic influences into his personal style of expression. Born in an intellectual family originated from a small village in the Yellow Mountain foothills, China, Leping Zha worked in black and white and exhibited when he was in his home country. He became serious in photography again in 1995, centering his field efforts in a few dedicated trips, plus numerous shorter outings each year. He makes annual long trip back to the Yellow Mountains, the exquisite Chinese location from where the ancient Chinese paintings started, and the place related most directly to his inner heart and resonant most deeply to his spirit, since year 2000. A perfectionist in nature, he devotes the rest of his time mainly scanning and processing his negatives to produce poster sized archival silver halide and carbon pigment hextone and quardtone fine art prints to the highest quality available today, which have been available through exhibitions and fine art galleries in California and Nevada, USA. Leping Zha has learned from masters including David and Mark Muench, Charles Cramer, Bill Atkinson, John Shaw, Richard Garret, Charles P. Farmer, Richard Lohmann, Yuntian Yu, and John and Barbra Gerlaches. Combining well balanced composition, quality lights, and strong use of color with ultimate attentions to fine technical details, Leping's work has earned numerous regional, national, and international awards. This includes the 2000 Cemex International Photography Awards and the Grant Prize of Earth Day 2000 Photo Competition "The Ultimate Image of Earth", displayed in local and national galleries and museums including the Smithsonian National Museum of Natural History, Washington D.C. His images have been selected for book and national photographic magazine covers, and appeared in numerous books, calendars, and magazines, including Nature's Best, the Chinese Popular Photography, and Nature Photographer, to which he has been a field contributor since 2001. In August 2001, he was awarded the "Artist of Year" title in San Mateo County, California. He received two Founder's Awards, one for the best color print and one for the best slide, in PhotoClave in November 2001, and "Best of Show", Gold and Silver print award in San Mateo County Fair 2001 and 2002. His on line portfolios was voted number one at photo.net in 2002, after their uploading to the prominent internet website. Recently, four of his color prints were selected for the Advertising Photographers of America (APA) 2003 photo exhibition of top 100 prints in San Francisco and appered in the Photo District News (PDN), the prestigious New York City professional magazine. Leping Zha has also contributed series of images to The AVA Guide to Travel Photography with Kaith Wilson, the founder of the British Outdoor Photography magazine authoring, as well as to An Immortal Heritage, a grand collective book of works from the best 140 Chinese landscape photographers, both published in late 2004. In recent years, Leping Zha started doing more social and humanity related subjects especially with dedicated infrared cameras. His infrared black and white landscape portfolios has appeared in the Camera Arts magazine, and received the Black and White magazine's Excellence Award (August 2008).